The fan reportedly “muttered the n-word” to Cousins during the Warriors-Celtics game on January 26. Cousins immediately “informed one of [Boston’s] security guys,” and arena security “took care of the fan,” which presumably means he was ejected from the building. 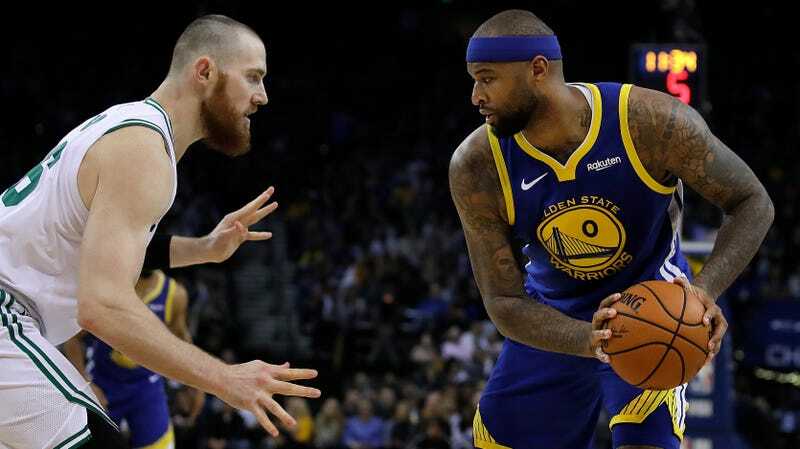 The resulting ban may have been levied that night, but according to Haynes it has not previously been announced, and in fact Cousins and the Warriors were only “recently” informed of that punishment. It’s interesting to contrast the handling of this fan with the way the Utah Jazz have handled two chuds who taunted and goaded Russell Westbrook in Utah over the last year. Recently, a fan was accused of shouting “get down on your knees like you used to” at Westbrook, both by Westbrook and by several of his teammates. The Jazz, upon completing an investigation of the incident, permanently banned the fan from their arena. Another Jazz fan who taunted Westbrook during the 2018 playoffs by repeatedly calling him “boy” has since been permanently banned from the arena. The Celtics, meanwhile, responded to a fan directing a racist slur at a visiting player by telling the fan to go away for a season and a half. The decisions of Jazz owner Gail Miller to permanently ban the obnoxious fans who taunted Westbrook were undoubtedly influenced by the extent of the controversy surrounding the more recent confrontation, which involved cell phone video of Westbrook threatening the fan and the fan’s wife, and which eventually led to a memo from the league office directing teams to address fan behavior via in-game public service announcements. The incident in Boston happened more than a month earlier, and went unreported. If nothing else, the discrepancy in the severity of these punishments might illuminate how teams view overt fan racism without the glare of public outrage guiding their decisions. Or, at worst, it might reflect different values and attitudes among the people making these kinds of decisions for the two franchises. No, wait, that can’t be it—several loudmouthed Boston knowers insist we should remain skeptical of all reports of the city’s racism without hard supporting evidence. Since this incident lacks video, Boston has no racism. Update (March 29, 5:35 p.m. ET): The Celtics released a statement saying that the banned fan was a minor, and the slur wasn’t caught on video.